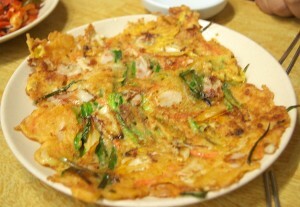 The Korean word “jeon” is often translated as “pancakes,” but jeon are not just a breakfast food, they’re eaten at all meals as side dishes, or as snacks. Basically, you coat your vegetables in flour and egg and then pan-fry with a bit of oil. Peel and wash vegetables before slicing them into small strips. Gently mix all the vegetables with 1 tsp of salt in a mixing bowl. Set it aside for about 3 minutes while making the pancake batter. Add all the ingredients for the batter to a separate bowl and mix. Add the salted vegetables into the batter. Mix the vegetables with the batter gently. Preheat a nonstick pan with a generous amount of oil on medium. Pour some of the batter into the oiled pan. Spread the batter out evenly and thinly with a fork. Using a generous amount of oil, and making the pancakes thin, are two more secrets for crispy pancakes. When one side of the pancake becomes golden brown, flip the pancake. Push the pancake with your spatula to give it a better texture. Cut your pancake into your desired shape and enjoy!